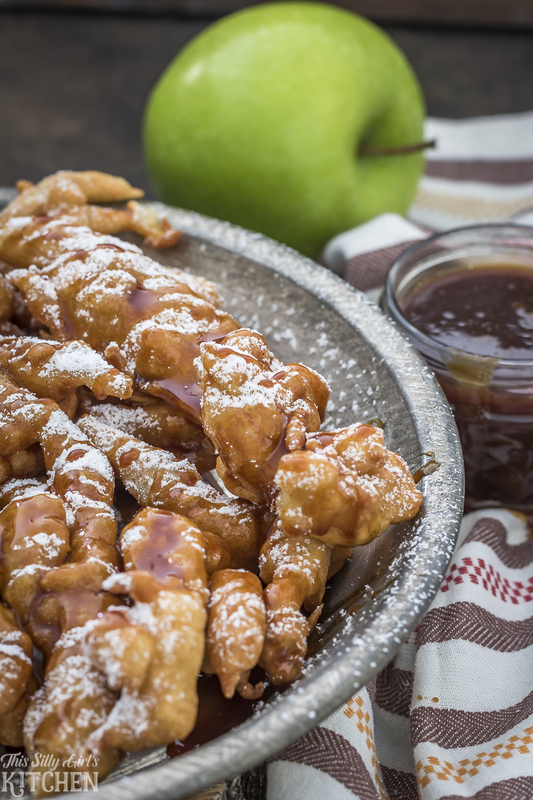 Bring on fall, bring on the fair, bring on caramel apples and funnel cakes! I am soooo ready. So, of course I had to make this insanely yummy concoction for you! 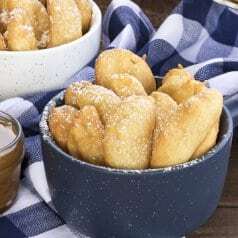 I know I have said this many many times before, but one of Jeremy’s favorite desserts are funnel cakes! He goes nuts for them. Last week we went to a minor league baseball game and we couldn’t even find our seats before he was stuffing his face with one! LOL, so I knew these would be a knock out, and they were! 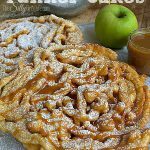 Basic funnel cake mix is spiced with cinnamon and pumpkin pie spice. 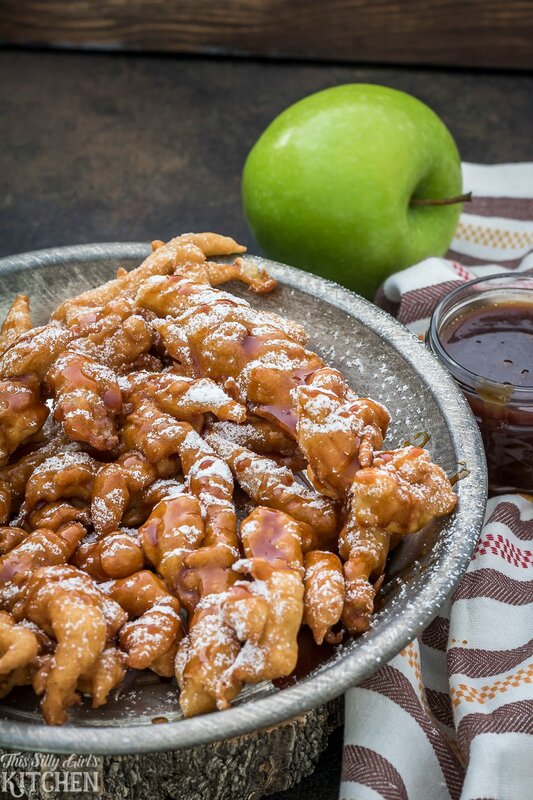 Finely diced apples, powdered sugar and caramel sauce makes this a unique fall dessert! The base recipe for the funnel cakes are the same as my Crispy Spider Webs! 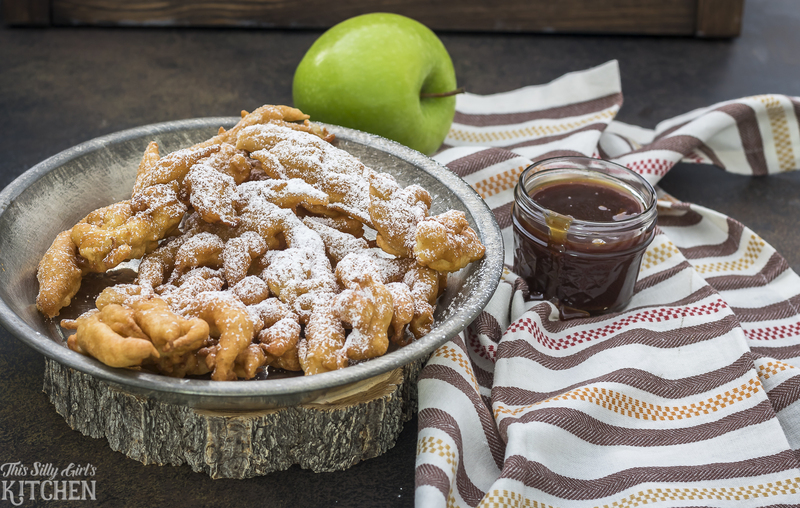 Here is a quick video tutorial on how to make these funnel cakes! 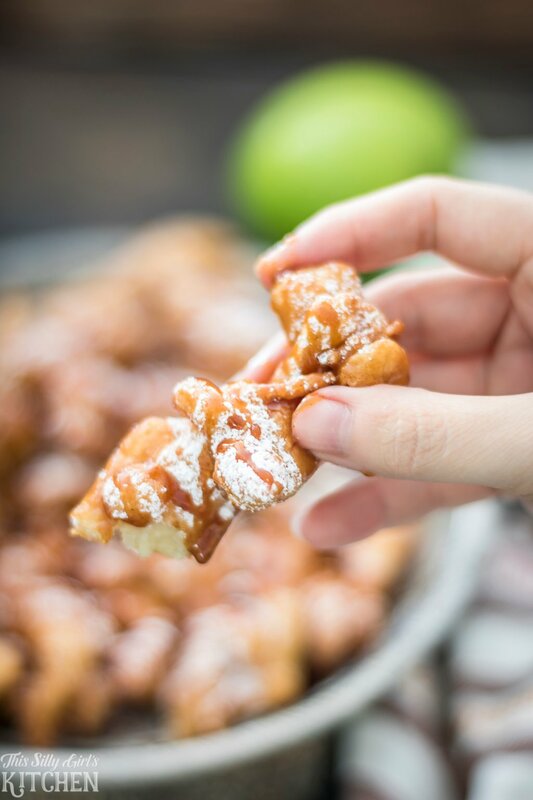 I serve mine with my Cinnamon Buttermilk Caramel Sauce, oh my! So yummy and easy! Just be careful with the hot oil, the batter is thin so it will come out of the bag fast! 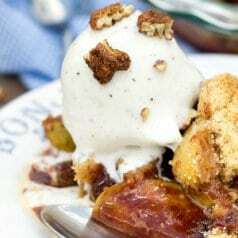 What is you favorite caramel apple dessert?? Place three inches of vegetable oil a heavy bottom skillet with deep sides. Heat over medium heat until hot, around 350 degrees. You can also use a deep fryer set to 350 degrees. Beat the eggs and sugar together until smooth. Carefully beat in the milk. Add the dry ingredients except for the powdered sugar and beat this until smooth with no lumps. Add in the spices, vanilla and diced apples and fold in until combined. Place ½ of the mixture into a gallon sized bag. Snip one of the bottom corners off and CAREFULLY let batter pour into hot oil. Make a large circle of the batter and connect it with more batter around and around in the pan. Let fry until golden brown on first side about 3 minutes. With a tongs, turn funnel cake over and let brown on the second side about 2 additional minutes. 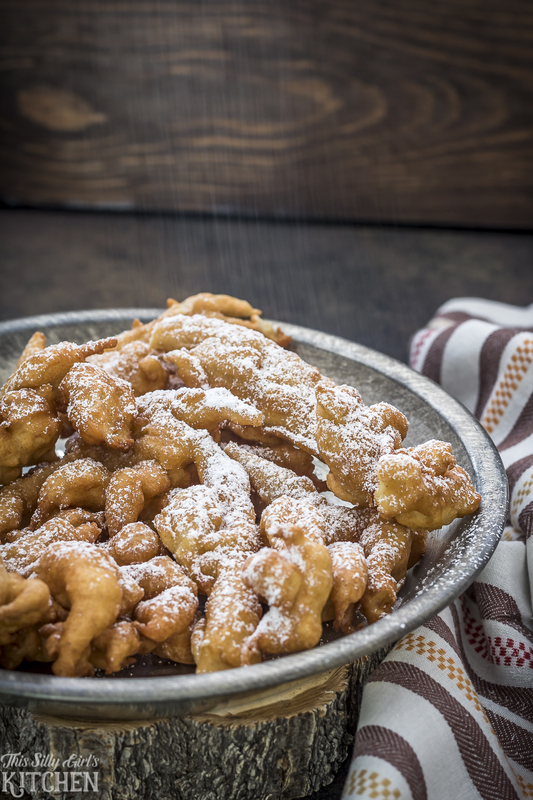 Let funnel cake drain on a paper towel lined plate. Top with powdered sugar and caramel sauce. Or, serve caramel sauce on the side for dipping, enjoy! 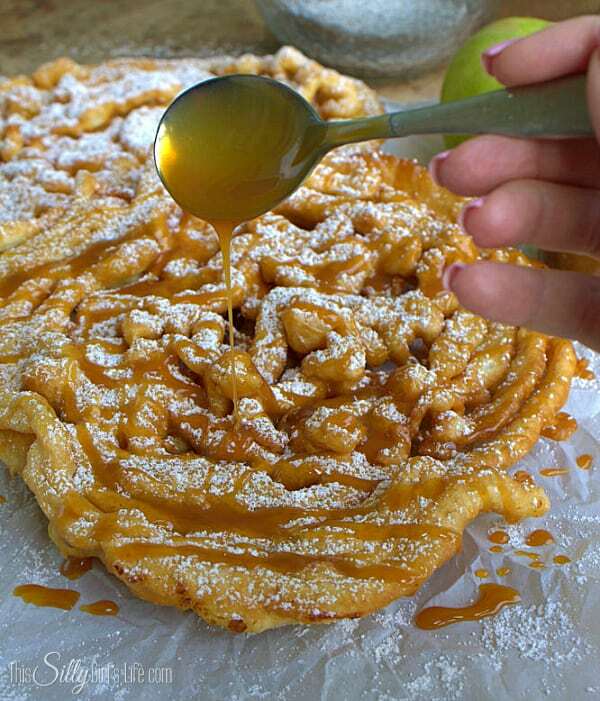 Funnel cakes and curly fries are the two best foods at the fair! I’m ready for fall too. 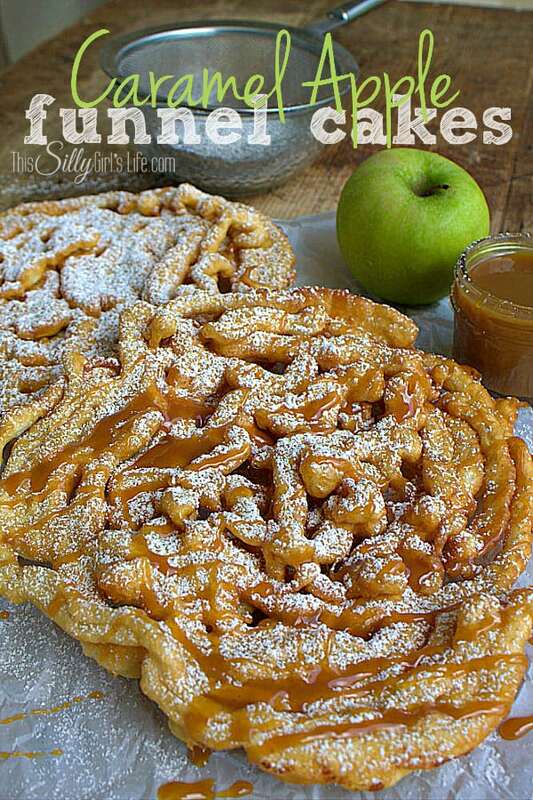 These funnel cakes look fabulous! Pinning! 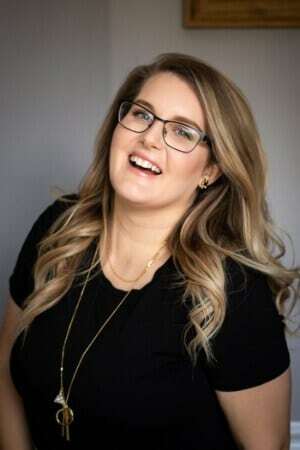 Stopping by from Pin Junkie, Pin It. I need about 10 of these! Thanks for linking up with What’s Cookin’ Wednesday! Wow these look incredible and making me really hungry! I can’t wait to try these now! Oh my yum!! 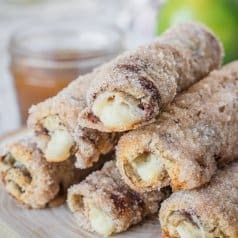 These look amazing!!!! Two of the best fair foods combined!